The Team Penske dominance continued during qualifications for Sunday’s Honda Indy Grand Prix of Alabama as teammates Josef Newgarden and Will Power swept the front row on Saturday afternoon. 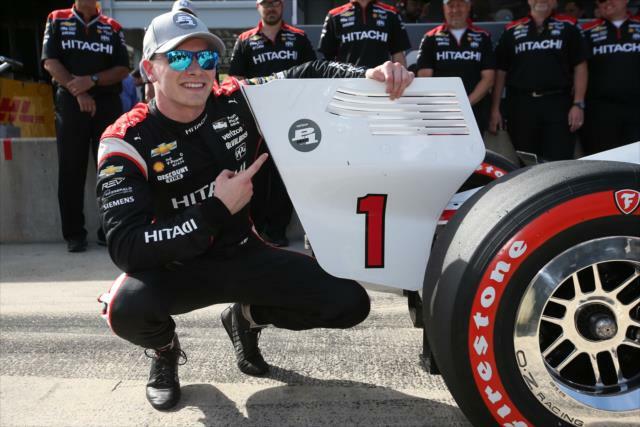 Newgarden, a former race-winner at Barber Motorsports Park, captured pole with a lap of 1:07.441s while Power posted a fast lap in the Fast Six of 1:07.454s. Dale Coyne Racing veteran Sebastien Bourdais came alive during qualifications and was quick enough to grab 3rd place on the grid with a time of 1:07.533s. “Tim (Cindric, race strategist) was telling me when I came in what the lap time was. I didn’t know if that was going to be enough,” Newgarden explained. “It was a good lap. Actually, I like this set of tires a little bit better than the others … you almost have a favorite sometimes with the Firestones, but they held up well. “After I saw the time we did on this set of tires I knew we had a shot at it. Really proud of everybody, Hitachi being on the car with us, it’s good to get them a first pole and just everyone else. Team Chevy has done a really good job. They have really given us the good power this weekend, good drivability. We are going to need some fuel mileage tomorrow, which I think we will have, but it’s going to get mixed up with the rain. Andretti Autosport driver Ryan Hunter-Reay was slotted 4th (1:07.780s), Schmidt Peterson Motorsports’ James Hinchcliffe was 5th (1:07.947s) and Chip Ganassi’s four-time champion Scott Dixon rounded out the Fast Six (1:08.030s). It was a strong session for Andretti Autosport who placed Hunter-Reay in 4th, while Marco Andretti (7th), points leader Alexander Rossi (8th) and rookie Zach Veach (11th) all made the second round of qualifying. This comes after Andretti and his No. 98 team has qualified poorly all year and Veach rebounded from some incidents in practice on Friday, not to mention a bout of food poisoning the rookie has been dealing with. The only rookie to qualify better than Veach was the sensational Robert Wickens, who placed his Schmidt Peterson Honda in 10th at the end of the day. Zachary Claman de Melo finished 16th in his Dale Coyne Racing machine, Jordan King was 19th for Ed Carpenter Racing, Matheus Leist 21st driving for A.J. Foyt Racing, and Rene Binder rounded out the rookies by placing 22nd for Juncos Racing. Carlin Racing had their best qualification session thus far in 2018, as Max Chilton and Charlie Kimball qualified 13th and 14th, respectively. It hasn’t been the weekend that Rahal Letterman Lanigan Racing was hoping for to this point as both of their drivers missed the cut for round two of qualifying. Rahal placed 15th in this session while defending Indianapolis 500 winner Takuma Sato was down to 18th. Single-car team Harding Racing was 20th with Gabby Chaves driving while an incident in the session make a bad weekend worse for A.J. Foyt Racing veteran Tony Kanaan. The best two lap times for Kanaan were disallowed, pursuant to Rule 8.3.5, and TK will start shotgun on the field tomorrow afternoon in 23rd. It will be an entirely different ball game on Sunday as rain is expected throughout the day, so keep an eye on veterans such as Kanaan, Sato and Rahal to possibly move up through the field as weather conditions begin to deteriorate. Stay tuned to Open-Wheels.com and Open-Wheels Twitter for the updates as they happen on race day. The Honda Indy Grand Prix of Alabama will go green Sunday at 3:00 PM ET, live on NBCSN. Images courtesy of INDYCAR Media.